Tinker Bell is a popular character from Peter Pan. She has appeared in many telvision and film versions of the Peter Pan stories. 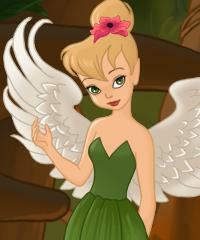 In this game you can dress Tinker Bell up in a fairytale style. There are so many options with hairstyles and accessories in this amazing game. Did you know that Tinker Bell nick name is Tink and her nationality is Neverland.